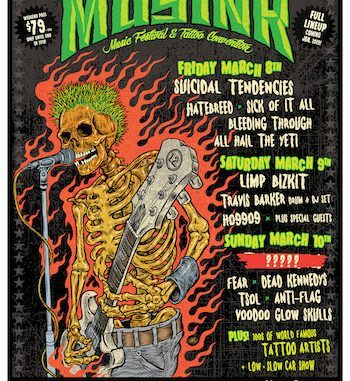 MUSINK will feature hundreds of world-renowned tattoo artists, music performances from top rock and punk artists including Suicidal Tendencies, Limp Bizkit, Travis Barker (drum & DJ set), Fear, Hatebreed, Dead Kennedys, Sick Of It All, T.S.O.L. and more, as well as the Low ‘N’ Slow Car Show presented by Famous Stars and Straps. Look for the full music lineup to be announced in early January. Travis Barker’s MUSINK also features daily tattoo contests, a vendor village, and the Miss MUSINK competition (presented by Sullen) at one of the world’s largest gatherings of elite tattoo artists. 2018 was MUSINK‘s biggest year ever with over 23,000 in attendance during the 3-day event. The Low ‘N’ Slow Car Show presented by Famous Stars and Strapsreturns to MUSINK, and will feature the best selection of custom rides, American classics and lowriders in Southern California on display, all handpicked by Travis Barker. A limited number of special $79.00 Weekend General Admission Tickets are available for purchase until December 31 at 11:59 PM PT, while supplies last. These $79.00 (plus fees) tickets are priced even lower than last year’s tickets as a special thank you to all the diehard MUSINKfans that have been part of the festival for the past 11 years.